The DSM series coax snake cables feature precision 4.5GHz miniature 23AWG coaxes for HD/SDI, standard SDI or high resolution video applications. 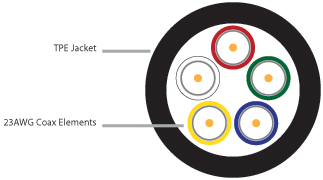 Each coax element meets or exceeds SMPTE 259M, 292M and 424M standards for high-definition digital video formats. Also built for easy termination, the DSM series coaxes have easy-to-strip outer jackets and dielectrics that streamline connector termination. The outer jacket is extruded from a flexible, rugged and abrasion resistant TPE compound that is ideal for portable and staging applications and UL rated for permanent installation. Gas Injected Foam PE .100" O.D. Low Pressure, Easy Strip PVC, .159" O.D. DSM3 3 Red, Blue, Green .465" 115 lbs/Mft 4.7"
DSM5 5 Red, Blue, Green, Yellow, White .550" 158 lbs/Mft 5.5"
DSM10 10 Red, Blue, Green, Yellow, White, Brown, Orange, Violet, Grey, Black .790" 316 lbs/Mft 7.9"